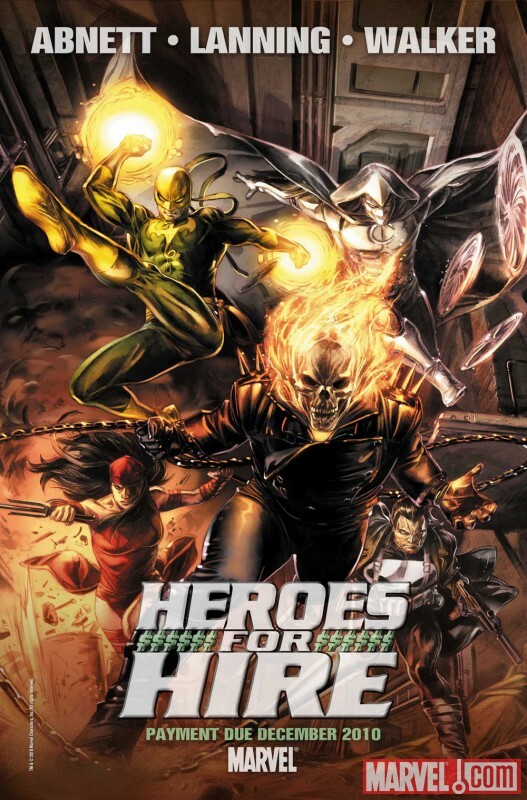 When it comes to Heroes For Hire what kind of deals can you get? Two for the price of one? Frequent customer discounts? Or if you select Ant-Man as part of your crew, do you get a free up-size? Seams like writer Dan Abnett and Andy Lanning have allot of answering to do, and their first few pages of Heroes For Hire #1 are up in response right now, exclusively at Comics Alliance. If you want in on the ground floor for the 'non-team' that stands to have Black Widow partner with the likes of Ghost Rider, and Falcon with Elektra, than you owe it to yourself to click this here jump. that clip art just below this posting title totally reminds me of that cheesy 70's flick called The Warriors. there were these scenes through out the movie that had this black woman talking into a microphone over the air waves through out the movie. you could only see the end of the mic. and her full luscious lips just like in that panel. first time in my life i thought it might be nice to be a microphone. Love the panels posted up at Comics Alliance. There's another title I'd love to get my hands on. No luck with X-Force by the way. Our local bookstore doesn't carry it. Does have every other X-team currently published, just not the one I want. Looks like I know what I'm asking the kids for Christmas now. A year of Heroes and X-Force. Ha Craig, maybe I ought to get in touch with Marvel about sales based commission you reckon? I love the 'next layer back' stars of both main universes, so putting Falcon, Black Widow and Ghost Rider in the same book is for me like attaching a vacum to my wallet. Give the writing to DnA and it's a done job. David - I might have to check The Warriors out, you are the second person that's pointed out the reference to me so far. Glad you didn't go down the career path of microphone, but appreciate the feedback all the same! From what I read (and saw), the artist made more than one nod to the movie. I've seen clips and read synopses, but have never seen the film in its entirity. Maybe I should grab a copy too.